The Importance of…Speaking Spanish or is it Valenciano? 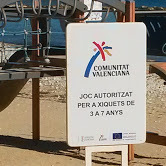 Can you read this sign at the beach play structure in Altea Spain? Neither can I and I speak (Castillian) Spanish. I thought it was important to be able to speak decent Spanish before I moved here. I spoke some Mexican/Latin American Spanish, but the pronunciation and some of the words are different. To that end, I used a computer program to learn Spanish, which included feedback on whether or not my pronunciation was correct. Whenever I encountered a native Spanish speaker, which in my birth state of California, was frequent, I would practice my fledgling language skills. I tried to practice Spanish on a daily basis, which included watching the 24 hour news from Spain. When I arrived, my Spanish was still somewhat halting, but did improve with regular daily interactions in Spanish. What I did not anticipate was that the official language of my village Altea is Valenciano. What? I had never even heard of that language. It is similar to Catalan, and Castillian Spanish, with some words and letters that are French. Many words here end in consonants. The word for the number eight is the same as in French, huit, whereas it is ocho in Spanish. However, Valenciano is clearly distinct, as I found out when trying to negotiate my way through the already confusing Spanish bureaucracy. Before one can get a residency card (after an already lengthy application in one’s country of origin,) upon arriving in Spain, one has to find a residence and then register it with the local Ayuntamiento (town government), which here is Ajuntament. Well, those two words were similar enough that I could figure them out, although not the ticket dispenser at the Ajunament where you first have to select the task you are there to do before you can get a number to get in the correct line. As well, I have found undecipherable some of the other writings I have encountered including those on public signs which are often only in Valenciano. 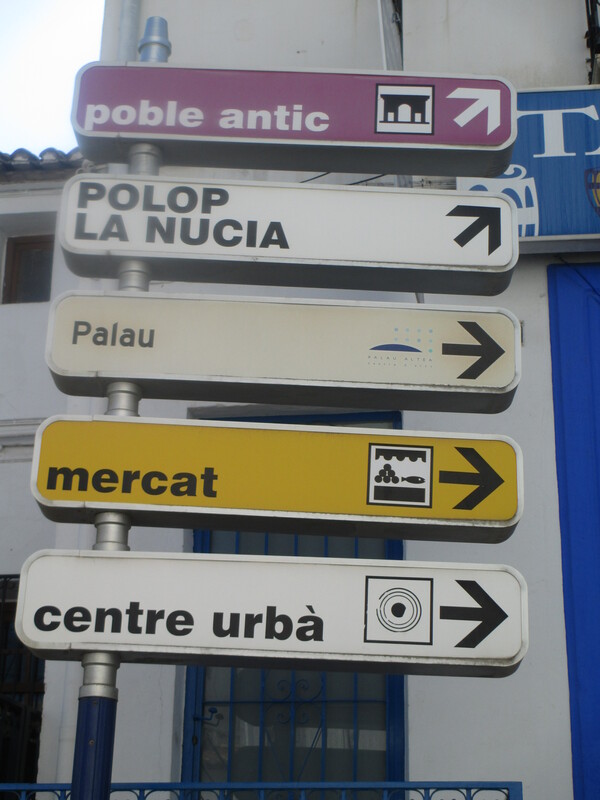 I only recently realized Poble Antic meant Old Town and that mercat is market. 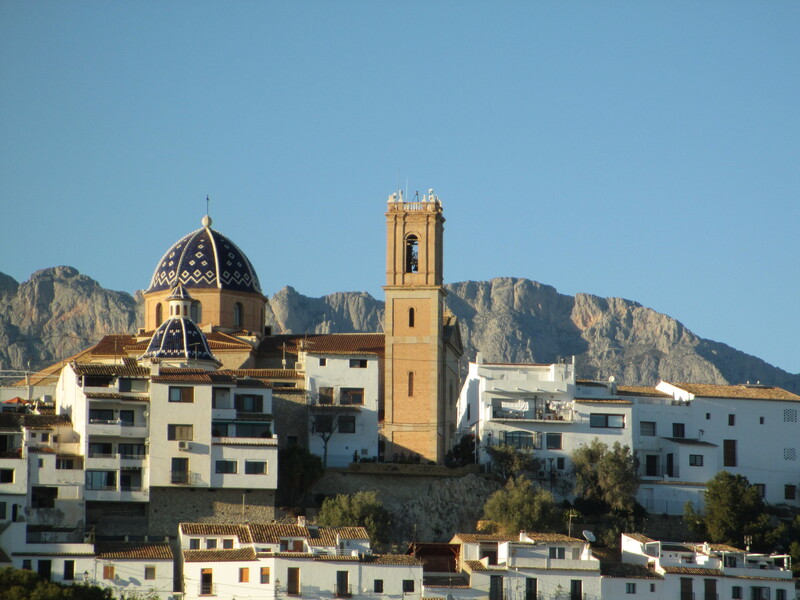 Altea’s economy relies heavily on tourism, with many Spanish and other European visitors, and it is highly doubtful that most of them can read the signs that are in Valenciano, unless one is from Catalan. This leads me to another interesting observation. My initial sense was that the people who are native to the Valenciano region are not exactly warm bedfellows with their Catalan countrymen just to the north. In fact, when one goes to make a withdrawal from a local ATM machine, there are choices of several European languages and Spanish languages of Valenciano, Galego, Euskera (Basque), Castillano, but not Catalan. Admittedly, I am no expert, and “Catalan/Valencian” are listed together as official languages in Spain, but I think it is no mistake that the word Catalan is not listed on the local ATMs. I subsequently learned that there is a Valenciano language controversy, which is too lengthy to discuss here. Some claim Catalan and Valenciano are the same language. There is a fear by some Valencian people of losing their culture and language to their northern neighbors, especially in light of their bid for independence. The people here are understandably proud of their local culture and foods, which includes many variations on paellas and rice dishes, (they are different and only a very narrow list of ingredients is a real paella), the bounty of the sea, and, of course, cheeses and many types of jamon. Like many older folks, many of the older natives with whom I have spent time or observed, are not interested in trying new cuisines. When my Cuban friend had a birthday party for her boyfriend, he and his friends did not want to try her Cuban rice and beans, baked pork, and fried plantains, which were deliciosos. I recently used my first Valenciano word, Carrer, which is Calle in Castillian Spanish, (“street” in English,) when giving my address. Further complicating the local language issue for me is that there are a significant number of Moorish words used, including many words that begin with “Al” and “Ben,” with Altea falling into this category. Fortunately, everyone I have encountered speaks Castillian Spanish, so the problem is mainly when dealing with public signs and official documents. I am pleased to be able to carry on conversations in Castillian Spanish. After a flamenco dance class, I ran into the teacher and we had a 30 minute conversation in Spanish, primarily about dancing, but also about what prompted her move from Extremadura region of Spain to Altea. The ability to carry on an extended conversation was very rewarding. In closing, my observations are my own, and are not intended to provide an academic discourse. Wow, Dawn, if you master Valenciana, you will able to communicate all over… Valencia! 😛 When I was there for Las Fallas, I was baffled at the language, and I thought I was crazy until someone told me that they have their own language!